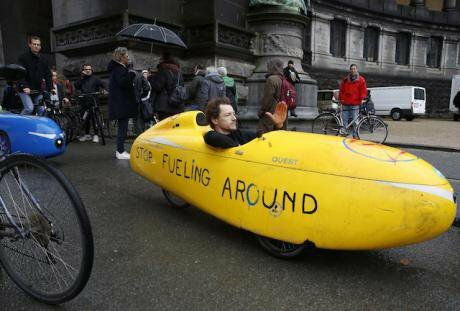 Cyclists take part in a march called "Claim the Climate" in Brussels, as the 24th Conference of the Parties (COP24) kicked off in Poland, a climate protest called "Claim the Climate" was held across Brussels. Ye Pingfan/PA Images. All rights reservedProtecting the environment plays a tangential role in the violent protests sweeping France since November 17, reaching a crescendo on Saturday, December 1. Donning the bright yellow vests required in French cars in case of a flat or other emergency, drivers all over the country are in the streets protesting President Emmanuel Macron’s new set of taxes aimed at curbing auto emissions. And even people who don’t own a car feel the solidarity and are joining in, to express their anger over another economic pressure on the middle, working and lower classes. In a nod to the 2015 Paris Accord, which attempts to limit global temperature rise to 1.5 degrees, the French government decided to raise taxes on automobile fuel prices substantially by over 20 percent. There is train service throughout France, but it is costly and plagued by long delays and frequent cancellations. “Make sure you demand a refund,” admonished a fellow traveller in a huff as she ran off to make other arrangements after a 4-hour delay ended in a train being taken out of service. While protestors are travelling to Paris to make their voices heard, there are also demonstrations throughout France. Similar scenes are taking place in Toulouse, yellow-vested workers shovelled cement and dirt in front of tax offices in Limoges and Total gas stations in St Chamond, and traffic has been blocked on the A47 highway to Lyon. In Aix-en-Provence, yellow vests lifted a tollbooth barrier and let drivers onto the A8 highway for free. Automobile exhaust is an important contributor to air pollution, but this fuel tax inordinately hits people of moderate to low income who are already using as little gas as possible. Meanwhile, COP24 is held in Katowice, Poland. Since the Paris Accord of 2015, emissions and pollution have continued to worsen, culminating in the United Nations’ dire warning in October that the world has only 12 years to contain climate catastrophe. Automobile exhaust is an important contributor to air pollution, but this fuel tax inordinately hits people of moderate to low income who are already using as little gas as possible, cannot afford to live closer to where they need to go or buy a new, fuel-efficient car. Curbing industrial emissions through technology or degrowth, improvement in mass transit, urban planning and policies aimed at gentrification and investment real estate are alternatives.